This page provides a summary of the current major housing developments/applications affecting Thakeham parish, with links to further information. If you are interested in related Rights of Way improvements, follow this link. At this meeting, District Councillors voted 12-1 (4 abstentions) to approve the proposal to amend the use of the Abingworth shop building to accommodate both a village store and a veterinary surgery (plus split of flat above into two units). Although objectors argued for delay for a further independent marketing exercise to seek a retailer who would take on the full current floor area, a majority of Committee members accepted the planning officer view that there was already sufficient evidence that this would be unproductive, and that the community would be better-served by approving the amended-use proposal and moving as quickly as possible to enable the two tenants who have already committed to open their businesses. Central Thakeham needs a shop as soon as possible to complement the other new Abingworth community facilities and create – as intended by original development permissions – a new hub for the village. The proposal, which includes two committed prospective tenants, offers ready deliverability. Whereas, refusal implies further considerable delay to re-market the full floor-space, with no reason to expect that process to secure a different and viable tenancy outcome. A large majority of District Councillors agreed with these arguments, and their decision gels with the view taken by the Parish’s planning committee in December 2018. The PC has been very aware that there have been many resident objections to these proposals, but its position has remained guided by the evidence, and a focus on delivering a sustainable arrangement for this important building, to offer the community good services, without further long delays. Following submission of formal application DC/18/2594 in December 2018, the Parish Council’s Neighbourhood Planning Committee of 17 December considered the issues and decided, for reasons set out in minute 458 of that meeting, to return a NO OBJECTION response to HDC. After further iteration of these proposals between HDC planners and the applicant, HDC’s Development Committee (South) is now due to consider DC/18/2594 at its meeting of 16 April 2019. The officer report to the Committee recommends approval. 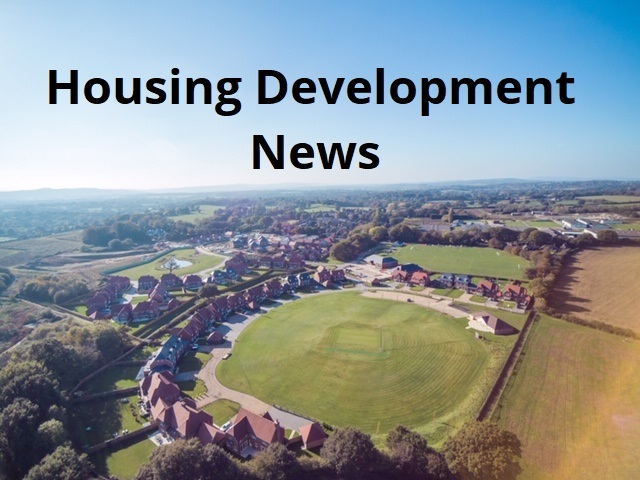 Abingworth Developments have determined the Build Agreement with Abingworth Homes, due to the fact that their sub-contractor, Oakford Homes, had failed to complete the building in accordance with the contract by the Longstop Date of 1st September. We are now embarking on assessing exactly what is required and talking with Abingworth Homes, who are cooperating in order that their contractual obligations are fulfilled. At the same time we are working with a view to submitting a planning application for the ground floor of the building which is intended to accommodate a new veterinary surgery and the new Village store and café. Both of these units are under offer and the tenants are looking forward to opening as soon as possible, hopefully in or around July next year. We will also be submitting proposed changes to the roof construction of part of the roof adjacent to the Village Hall and football pitches, together with an application for change of use of this part of the first floor which is presently identified as office and storage, to provide a further (i.e. a second) 2 bedroom flat. This application should be made within the next 10 days. When HDC refer this for public comment, we will attend the relevant Thakeham Parish Council planning group meeting to present this application, and will provide fuller information about the tenants at that time. In the meantime residents may see that there will be ongoing remedial work at the shop property, particularly to the roof, although the exact extent of this work is still under discussion. Following informal consultations in April 2018 (see below), Thakeham Tiles submitted this formal application for outline permission for 90 houses at this site. After deliberation at its Neighbourhood Planning meeting of 22/10/18, the Parish Council’s agreed response is below. 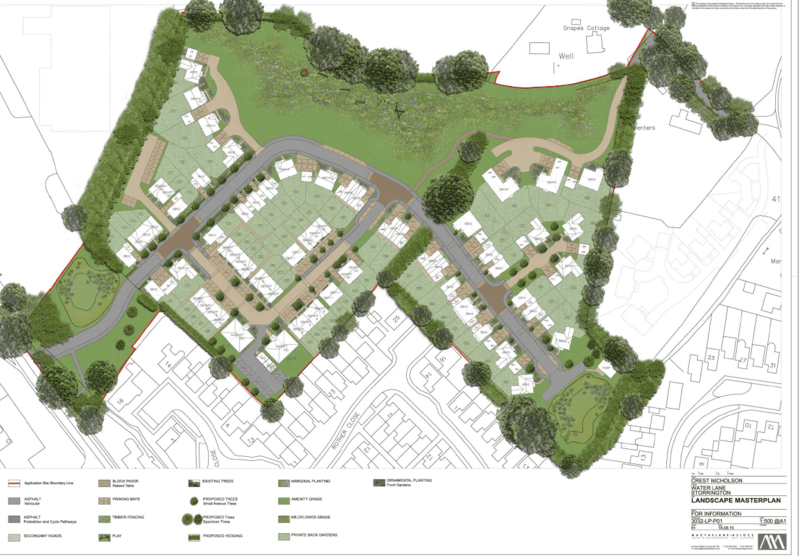 Outline planning application for the demolition of all existing buildings, the erection of 90 dwellings with associated works and the formation of a new access onto Rock Road. All matters to be reserved, except for means of access. Members noted that the general context of this proposal is that the Thakeham Tiles site is specifically identified in the Thakeham Neighbourhood Plan as developable for further housing (TNP Policy 2), and is the only site so identified. The current proposal for 90 units follows extended pre-app engagement with HDC and an informal community consultation process in spring 2018, when 105 units had been indicated. The site location in the eastern suburbs of Storrington is considered relatively ‘sustainable’. Of the three key criteria in TNP Policy 2, the proposal appears broadly to meet those relating to protecting the footpath route, and retaining woodland around the edge of the site. The key issue is whether the proposal gels with the third TNP Policy 2 criterion that it should deliver ‘an appropriate number and type/size of dwellings which reflects the character and housing density of the local residential area’. In practice, assessing the answer to this has to involve considering and balancing the aspect of local residential density/character with ensuring that the proposal is viable in terms of enabling the business to move to a more appropriate location in the area (as the whole logic of TNP Policy 2 requires), while also bearing in mind the realities of the current housing planning framework. iii) Firm numbers ceiling: any total quantum approved by HDC at this outline stage must not exceed 90 and should be clearly framed as a fixed and non-negotiable ceiling, strongly dissuading attempts to use future s.73 applications to add additional units. 2.3 Tree retention: although the proposal involves retaining the mature tree belt around the sides of the site, it nevertheless currently involves loss of >50% of the woodland in the southern half of the site. These trees are covered by an existing group TPO (as is another group at the north of the site, less affected by the proposal). HDC officers are asked to closely review the proposal with a view to retaining as many trees as possible, for both landscape amenity and ecological reasons. There is a specific concern that the tree line at the western boundary of the site may be inadequate and in need of thickening. 2.4 Drainage arrangements: members agree with HDC drainage officers that the proposals would benefit from further work to address WSCC Sustainable Drainage Systems (SuDS) expectations for betterment of surface water systems, in terms of retention at source through green roofs, permeable paving, swales and other landscaping to improve the local green infrastructure provision and biodiversity impact. Monaghan’s Mushrooms have issued a statement clarifying that they are in the process of making some changes to the focus of their production at Thakeham, towards organic mushrooms. This will have some impact on production volumes and staff numbers, but Monaghans emphasise that they remain committed to the Thakeham site and that this is demonstrated by further short-term investment plans. Monaghan’s full statement is below. Their reference to works at ‘the front entrance’ refers to reconfiguring the layout of the front entrance/exit of the site to physically prevent HGVs from turning northwards on the B2139; this was part of the original planning commitments relating to the Abingworth development. Thakeham Tiles Ltd., based at Rock Road, have begun the process of bringing-forward a planning proposal to relocate their business locally, and re-develop their existing site for housing. Further information about their proposals is provided in the notice below, which is being circulated this week to residents of Thakeham parish and other postcodes around the current site. A consultation event and exhibition on Wednesday 18 April 2018 was arranged to provide local people with the opportunity to view and comment on the emerging proposals. Information linked to this event is available below. October 2017 – New Pre-School building now due for delivery December 2017. 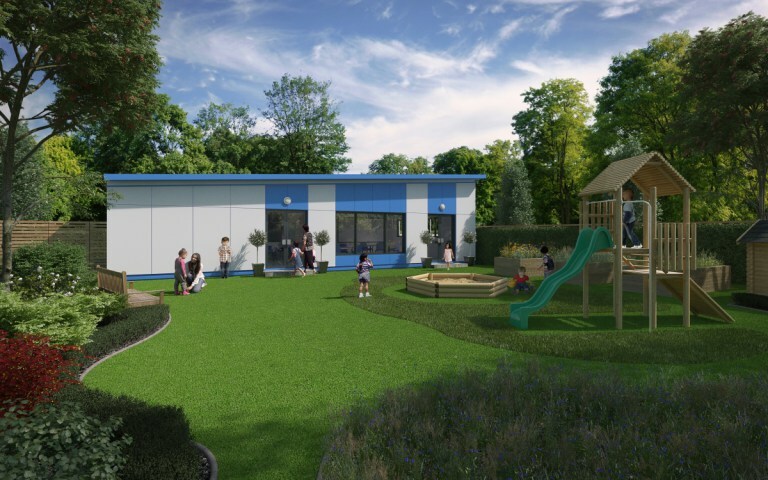 The delivery of the new Pre-School building, originally due for September 2017, has been delayed by design and construction issues and has now been put back to December 2017. Arrangements have been made to allow the Pre-School to remain in the current Village Hall for autumn term 2017, with a view to transferring to the new facility over the Christmas 2017 break. The team remain very positive about the move and the opportunities it will create to enhance children’s experience. Find out more. The Parish Council is aware of longstanding demand from residents for an allotment area in central Thakeham, and provision for this has been secured via the Abingworth development. Follow this link to find out more. May 2017 – Abingworth phase 1 affordable housing: the first phase of the Abingworth development includes two blocks of affordable housing, which are now nearing completion and are being marketed with a view to occupation later in 2017. At the north-west corner of the site 20 local worker units are being marketed as ‘Abingworth Farm’, and towards the south-west of the site a further 12 affordable units are being marketed as ‘Abingworth Crescent’. There are a mix of 2 and 3 bedroom houses, which are being let via a combination of shared-equity and affordable rental schemes. With regard to letting of the Abingworth Farm local worker units, priority is to be given to local workers and residents. Follow this link for more information. April 2017: Abingworth Phase 2 review – further to recent developments outlined below, this proposal was considered by HDC Development Committee (South) on 25 April 2017, and the proposal was approved. The Parish Council will continue to work with the developer and HDC on design and implementation details, and in particular with WSCC Highways team, on the final design of traffic calming measures. More information on this. January 2017: Abingworth Phase 2 review – application to amend house numbers/mix now submitted. Following consultation processes outlined below, Abingworth Homes have now applied to HDC (DC/16/2835) to amend the part of the existing development permission relating to 51 bungalow-style units designated for the over-55s. In essence, the proposal would increase house numbers to 62 units in total and remove the over-55s condition. The revised mix would be: 29 x 3-bed and 33 x 4-bed ‘family sized dwellings’. Of these, 40 would be 2 storey dwellings and 22 bungalow style. This would include 4 further affordable units, to be delivered as 2 x 3-bed semi-detached units. The proposed road layout has been adjusted, and there is also provision for a flat above the village shop. The Parish Council’s response to this proposal was decided at its Planning meeting of 23rd January 2017, and can be read here. November 2016: Abingworth Phase 2 review – Open Meeting Saturday 12 November. The developer has arranged a local consultation event for 12 November 2016, in the Thakeham Village Hall. An open exhibition (10am-2pm) will be followed by a Q&A session chaired by the parish council at 2pm. Find below a flyer from the developer in advance of this meeting. There is also a further major housing application at Snapes Corner (Gladmans Developments), which is not part of the parish’s plans and is currently subject to the planning process. The locations of these developments are shown below. The site location is shown on the map above and comprises around 34 hectares of mainly disused mushroom production facilities, with the remainder being agricultural land. Housing on the main site, east of the B2139, is located in the west and centre of the site, with the remaining eastern fields reserved for agricultural use (protected from further development by a buffer zone/ransom strip). The site also includes, on the west side of the B2139, a corner of the adjacent Chesswood Farm site, where the 20 key worker homes will be located. This development has been subject to lengthy planning process – set out in full here. In summary, the original planning permission (DC/10/1314, approved in 2013) permitted 146 dwellings, subsequently amended to 147 in Spring 2016. The approved housing mix comprises 64 open market dwellings, 51 dwellings for the 55 plus age group, 12 affordable dwellings and 20 key worker dwellings. In addition to the dwellings, various community and sports facilities were permitted. A 2013 challenge to these proposals via judicial review was rejected. The development featured an ‘enabling’ financial arrangement of £3.75 million towards the refurbishment of the facilities at the adjacent Chesswood Farm site, to enable the mushroom cultivation activities to continue, securing local employment. As per the requirements of this arrangement there has been investment in modernising mushroom production facilities (now run by Monaghan’s Mushrooms), including significant renewal of growing sheds, installation of new water-storage/pumping related plant, upgrading of power and drainage infrastructure and building refurbishment. This work is ongoing but HDC confirmed in late 2015 that planning conditions relating to this investment have been discharged. Landscaped areas including a large pond and new location for the ‘Penn Stone’ (from which the Quaker William Penn is reputed to have preached in the 17C). New public Rights of Way, including a new east-west bridleway. The current approved site layout can be see below; the multi-coloured area is phase 1, for which house numbers/designs are fully specified, and the pink area is phase 2 (where the housing mix/number originally approved in 2013 is subject to review). Construction of phase 1 by the contractors, Oakford Homes, is well advanced. The phasing of delivery of the new community assets is linked to when certain numbers of houses are delivered and occupied. The parish is working closely with the developers to seek to deliver these facilities earlier than the latest point required by the contract. In August 2016 the parish invited comments on indications that the developer was seeking changes the mix and number of houses in phase 2 of the Abingworth development. Without extending the consented building area, the proposed change could increase total house numbers over the 147 currently permitted. While a change of this scale would be significant, there are good reasons to review and consider the options seriously. The currently approved scheme does not seem to the Parish Council to reflect local demand, being dominated by a large number of homes designated for the over-55s, alongside mainly large executive-style houses. A better balance of smaller and medium-sized homes could allow more local families to remain in the area. Some increase in house numbers at Abingworth would also strengthen the parish’s ability, via its Neighbourhood Plan, to resist speculative development of less suitable green spaces over coming years. There may also be an opportunity to secure additional village benefits, beyond the new facilities already due from the project (see above). At the same time, we must clearly also consider potential negative impacts and how they can be limited. Hence we have begun the process of consulting residents about what is the right housing mix, whether some more houses on the site would be acceptable, and whether there are missing facilities or support services that the parish should pursue as part of this. Responses to date show that many local people would be in favour of some change to the currently-permitted housing mix – towards more affordable 2/3 bed properties. However, there are also concerns relating to increasing numbers of houses, with issues raised particularly about impact and the capacity of local infrastructure in relation to local schools, healthcare, public transport and traffic on the B2139 between central Thakeham and Storrington. Click through to find a digest of responses (to 19 August 2016) and a set of FAQs arising from the process. The developer has arranged a local consultation event for 12 November 2016, in the Thakeham Village Hall. An open exhibition (10am-2pm) will be followed by a Q&A meeting chaired by the parish council at 2pm. As and when a further specific planning application emerges, this will also be subject to local scrutiny at a Planning meeting open to the public, at which the parish’s formal response will be agreed. It is clear that safer walking/cycling routes to Storrington and improved public transport are high amongst Thakeham residents’ priorities. The Parish Council is working with WSCC and colleagues at Storrington & Sullington PC to develop a plan to improve pedestrian/cycling links between the villages, including improving safety arrangements around the Rydon and Water Lane roundabouts. The parish is also working with WSCC and the Abingworth developer on a phased programme of traffic calming measures for the 30mph section of the B2139 in central Thakeham. There is a need to take effective action to reduce traffic speed in the 30mph zone (where actual car speeds were found to average 40mph several years ago). WSCC Highways now oppose the original proposal for raised speed tables but seem open to considering other approaches. A two-phase approach has been agreed with the developer, aligned to the phases of house construction. For Phase 1, steps will focus on the new northern road junction, upgraded arrangements at the existing crossing-point north of High Bar Lane, roundels and other road surface treatments and also SID signs (flashing speed indicators) at the north and south boundaries of the 30mph zone. Abingworth Developments will liaise with Monaghan’s Mushrooms to include changes in this phase of works to entry/exit arrangements to discourage HGV travel from/to the north. The parish is also liaising with Sussex Police on additional signage to reinforce the 30mph speed limit. Linked to Phase 2, further traffic-calming measures will be developed based on updated traffic volume/speed data. If the data is supportive this could include ‘priority’ calming, i.e. traffic entering the 30mph zone being forced to give way to traffic exiting. There may also be a new crossing at the northern site junction, for a proposed extension of the new east-west bridleway through the site across to the west side of the B2139 (linking through to High Bar Lane near the play area). In due course discussions will also be opened with bus companies towards improving the local service. This section will be updated as these discussions move forward. Follow this link for further information about the affordable housing for keyworkers/local residents. For more detail on the planning background and current agreements, go to Horsham District Council’s planning portal and search on ‘Abingworth Nurseries’. The location of the site is shown on the map above. Previously rough grassland, the site is bounded on the northern and western (Water Lane) boundaries by trees and hedges, with a stream flowing along the south-western boundary. To the south and east the site are existing residential roads Brook Close, Rother Close, Concorde Close, Jubilee Way, Rainbow Way, and St Marys Close. North of the site are open fields and Snapes Cottage, a Grade II Listed Building. This development has also been through a complex and extended planning process. The developer’s original application in 2013 (DC/13/1265) was resisted by Thakeham and neighbouring parish councils and refused by Horsham District Council, but was allowed by Inspector on appeal in 2014. The upshot is approval for 76 houses, and some communal amenities (children’s play area, pond area). Construction began in late 2015 and is now well-advanced, and the development will end up looking as shown in the drawing below. 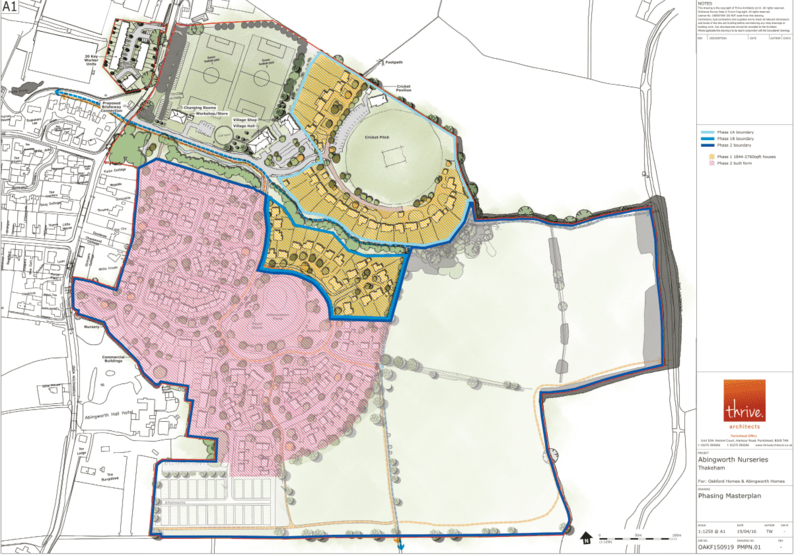 For more detail on the planning background and current agreements, go to Horsham District Council’s planning portal and search on ‘Land North of Brook Close’. This site is the subject of a major housing application which Thakeham Parish and Horsham District Council are strongly resisting. The location of this site is also shown in the map above. It is a greenfield site and part of the open space separating the built-up areas of Thakeham and Storrington. In late 2015 application DC/15/2374 was submitted by Gladmans Developments to construct 107 houses on this site. Thakeham Parish Council strongly objected to this proposal (see full statement), which was subsequently refused by Horsham District Council (for these reasons). Gladmans have subsequently (July 2016) submitted a further revised application (DC/16/1489) for up to 60 houses on the same site. Thakeham Parish Council has strongly objected again, on the same key grounds as the previous application. This site is not included as a developable location in the draft Thakeham Neighbourhood Plan, and is designated as ‘non-developable’ in the current HDC Strategic Housing and Economic Land Availability Assessment (SHELAA). HDC subsequently refused this application. The appeal of HDC’s refusal of DC/15/2374 is due to be heard by an Inspector in April 2017. Further news relating to this proposal will be posted here when available.